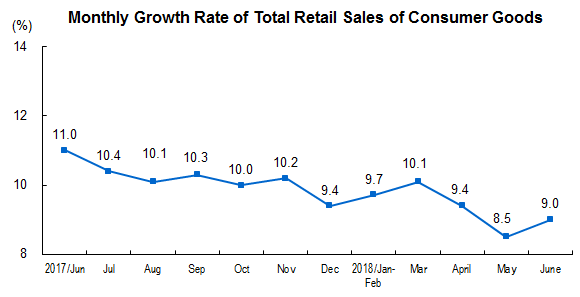 In June 2018, the total retail sales of consumer goods reached 3,084.2 billion yuan, up by 9.0 percent year-on-year (nominal growth rate. The real growth rate was 7.0 percent. The follows are nominal growth rates if there’s no additional explanation). Of the total, the retail sales of consumer goods of units above designated size was 1,244.8 billion yuan, increased 6.5 percent. From January to June, the total retail sales of consumer goods reached 18,001.8 billion yuan, up by 9.4 percent year-on-year. Of the total, the retail sales of consumer goods of units above designated size was 6,993.8 billion yuan, increased 7.5 percent. In terms of different areas, the retail sales of consumer goods in urban areas was 2,637.5 billion yuan in June, up by 8.8 percent year-on-year; while that in rural areas was 446.7 billion yuan, up by 10.4 percent year-on-year. From January to June, the retail sales of consumer goods in urban areas was 15,409.1 billion yuan, up by 9.2 percent year-on-year; while that in rural areas was 2,592.7 billion yuan, up by 10.5 percent. In terms of different consumption patterns, the catering services in June gained 340.1 billion yuan, up by 10.1 percent, year-on-year. The retail sales of goods gained 2,744.1 billion yuan, up by 8.9 percent. From January to June, the catering services gained 1,945.7 billion yuan, up by 9.9 percent, year-on-year; the retail sales of goods gained 16,056.1 billion yuan, up by 9.3 percent. The retail sales amount of goods of units above designated size in June was 1,167.1billion yuan, up by 6.4 percent year-on-year. From January to June, the retail sales amount of goods of units above designated size was 6,553.8 billion yuan, up by 7.6 percent year-on-year. From January to June, the national online retail sales of goods and services was 4,081.0 billion yuan, increased 30.1 percent year-on-year. Of which, the online retail sales of physical goods was 3,127.7 billion yuan, increased 29.8 percent, accounting for 17.4 percent of the total retail sales of consumer goods; of the online retail sales of physical goods, food, clothing and other commodities went up by 42.3, 24.1 and 30.7 percent respectively. From January to June, of the total retail sale, the supermarket, store, pro shop and exclusive shop of units above designated size went up by 7.4 percent, 4.6 percent, 9.5 percent and 6.2 percent respectively. Total Retail Sales of Consumer Goods: refers to the sales of physical commodity or the income of catering services sold or provided by enterprises (units) to individuals, social organizations for non-production and non-operation purposes. Online Retail Sales: refers to the sales of goods and services got through public online trading platform (including self-built websites and third-party platform). Goods and services include physical goods and non-physical goods (such as virtual product, services). The total retail sales of consumer goods includes online retail sales of physical goods, excludes online retail sales of non-physical goods. The corporate enterprises, industrial activity units or self-employed individuals which retail goods or provide catering services. Enterprises (units) above designated size refer to those wholesale enterprises (units) with an annual revenue from primary business of 20 million yuan and above, those retail enterprises (units) with an annual revenue from primary business of 5 million yuan and above, and those hotel and catering enterprises (units) with an annual revenue from primary business of 2 million yuan and above. All enterprises (units) above designated size are surveyed, while the data of enterprises (units) below designated size are collected by sampling survey.